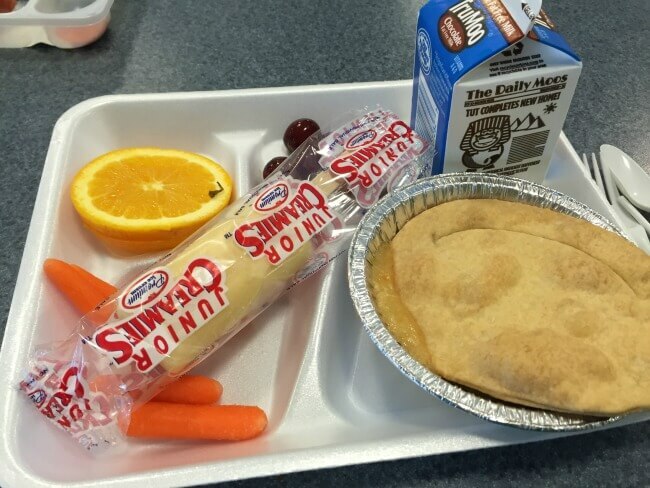 My kids have been telling me how great the chicken pot pie at school lunch is. They were so devastated when a couple of weeks ago the oven at the school broke down and they missed out on chicken pot pie day. I decided to make them chicken pot pie for dinner and see how it compared to the school lunch version. I’m happy to report that my slow cooker version of chicken pot pie was a hit! And it is totally homemade…no cream of chicken soups or biscuits from a can (although I have nothing against that). I started with cubing some yellow potatoes and some uncooked boneless, skinless chicken thighs. 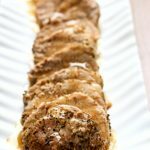 I like to use thighs in my slow cooker recipes because the chicken always turns out really tender and moist. You can also use chicken breasts, if you prefer that. Sometimes I like to use a combination of the two. The white and the dark meat work well together…you kind of get the best of both worlds (healthier and juicier). Then you add in some creamy sauce and let it cook on low for several hours. After the potatoes and chicken are cooked through you’ll add in a bag of frozen peas and carrots and then top with freshly baked biscuits. Dinner in a bowl that couldn’t be more comforting…or more requested. This recipe will be a family favorite! For this recipe I made homemade cream of chicken soup (from Pinch of Yum) and homemade biscuits (from Completely Delicious). 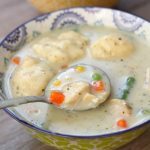 If you want to use a can of cream of chicken soup and a can of biscuits…you could totally do that too. And guess what happened just today? My daughter asked if I could come join her for lunch at school. And they were serving Chicken Pot Pie! This is what it looked like (not to be rude but I think mine looks and tastes a lot better). Have you subscribed to receive my free emails? 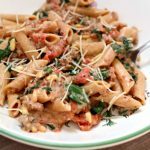 I send you all the new recipe posts so you don’t have to remember to check the blog. It’s free and you can unsubscribe at any time. Click here to sign up today! 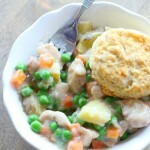 A creamy and comforting chicken pot pie made in the slow cooker and then topped with homemade biscuits. Wash the potatoes and cut into cubes. Place in the bottom of the slow cooker. Cut the chicken into cubes. Place into the slow cooker on top of the chicken. Salt and pepper the chicken generously. Spoon the cream of chicken soup on top of the chicken. Cover the slow cooker and cook on low 4-6 hours, or until potatoes are tender and chicken is cooked through. Add in the frozen peas and carrots and stir. Turn the slow cooker hot and cook until the peas and carrots are warmed. 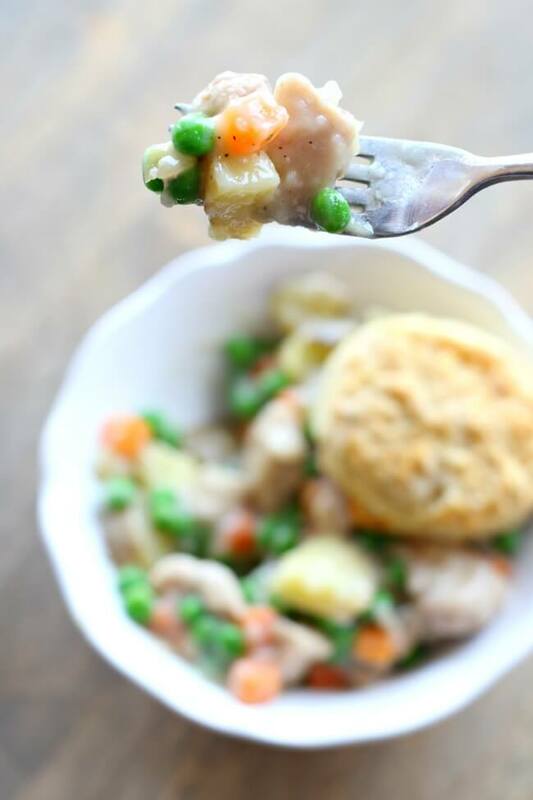 Serve chicken, sauce and veggies in a bowl and top with a biscuit. 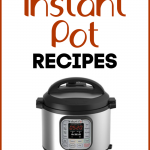 I used a 5 quart slow cooker for this recipe. But a 6 quart would be fine too. This is my favorite 6 quart slow cooker slow cooker. This is an affiliate link for Amazon. Each time you purchase something from Amazon that I’ve linked to I get a few pennies. Thanks so much for supporting my blog! Can I add the uncooked biscuits too the crockpot and cook everything together? Or maybe even dumplings? Your amazing Karen ty. Can this be frozen? 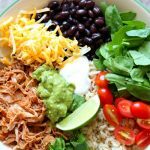 I’m having surgery and I want to freeze slow cooker meals. It probably could…I’m not sure how the potatoes would do though? I’m kind of in a hurry and need to use canned soup (gasp!). Should I add it straight from the can or should I un-condense it? Thanks! Ha ha! I do it all the time. Just add the can of condensed soup! 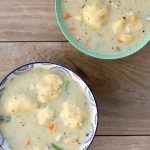 If you are gluten intolerant this is a great recipe to use in place of canned soup. It can be used in so many recipes so thank you for sharing it with us. 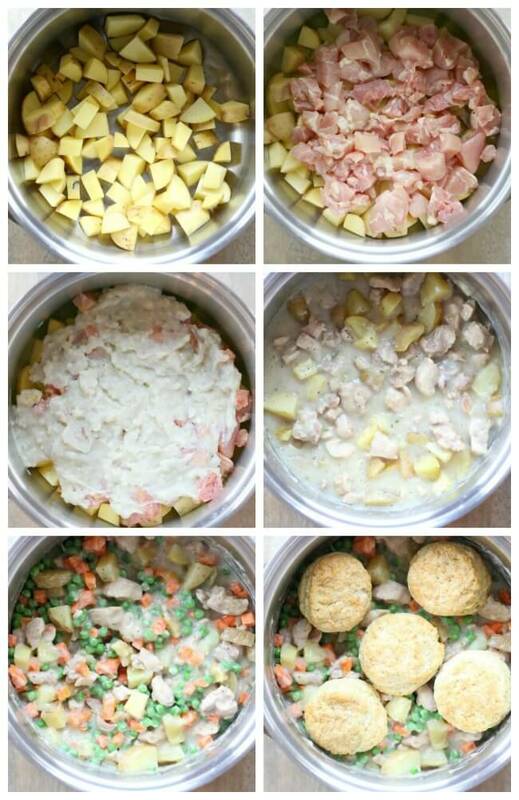 Can you please post recipes for the “casserole” crockpot. I know you will have many happy followers. Love your recipes! Yes I love the casserole crock and use it often! I will post more recipes soon. I don’t use any canned soups in mine either and my kids love it. 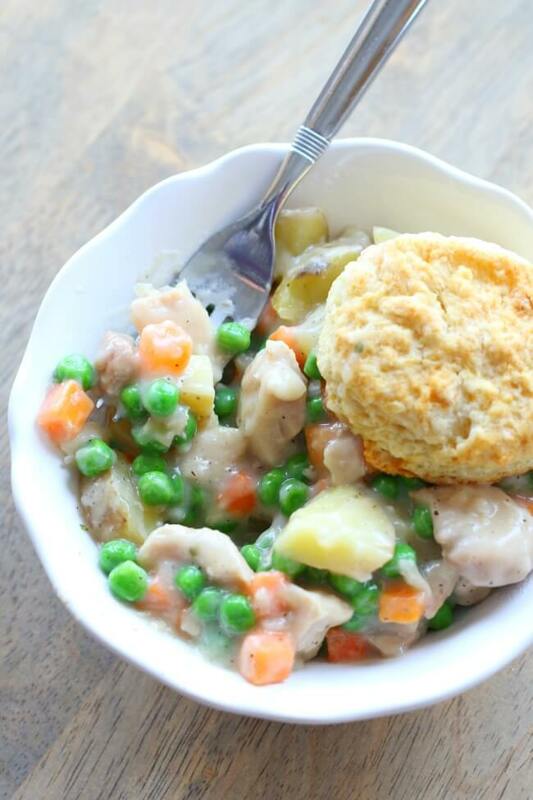 Pot pie is such a great comfort food recipe! But I’ve never tried making it in the crock pot, and I’ve also never topped with biscuits. I’m excited to try something new! Thanks, Karen! Looks yuumy! What size slow cooker did you use? Hi Katrina, I used a 5 quart slow cooker. A 6 quart would work just fine too!